Who is Phil York? 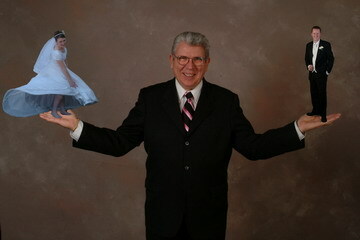 I am an ordained minister and licensed to perform weddings in the State of Nevada. I have a Masters in Divinity from Gorden Conwell Theological Seminary and a Masters in Counseling Psychology from Pepperdine University. I am 6’3” tall with gray hair, married with children, I like to have fun, performing weddings and having the honor of sharing such a special day with you is my passion. My purpose is to help you plan your special day. Most couples have questions about what is needed. The simple answers are as follows. (You need that special someone who you want to marry. You need a marriage license which can be obtained at Third and Clark (201 Clark Avenue Phone: 702-671-0600) at the Courthouse in down town Las Vegas. They need both of you to come down and fill out simple paperwork and $55 cash.) And don’t forget your rings!